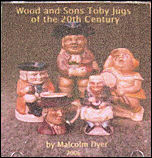 NOTE: The following extract is taken from the collectors guide, Wood and Sons Toby Jugs of the 20th Century which covers the Toby Jugs made by Wood and Sons, H. J. Wood, Tony Wood and Wood Potters of Burslem during the 20th Century. The 130 page book is illustrated with over 100 colour images of Toby Jugs, base marks, certificates and advertising material. A full listing of Limited Edition jugs by the various Woods companies and a comprehensive price guide. A chapter on the Capper Works, Cobridge, Stoke on Trent including colour images. When Wood and Sons was formed in 1865 by Thomas Francis Wood its pedigree was unrivalled. Thomas was the fifth generation in line to Moses Wood who was brother to Aaron and Ralph. These three giants of the 18th century potteries laid the foundation of the Woods dynasty which was to survive for over 200 years. Thomas, a prominent citizen in the potteries and later to become the Mayor of Burslem, built Wood and Sons into one of the largest companies in the area. By the early years of the 20th century the company had expanded to include a number of potteries, those included the Trent, New Wharf, Stanley and the Alexandra. The latter was run under the name of H.J. Wood and although sharing the New Wharf site, was run as a separate company. H.J. Wood was owned by Thomas's younger brother Henry J. Wood. In 1889 Thomas's son Harry Francis Wood joined the company and by the early part of the century had become its chairman. Using his ability to recognise and nurture talent, together with his undoubted skills as a businessman, he continued the growth of Woods for the next forty years. In 1912 Frederick Rhead was appointed as art director of Wood and Sons and was joined by his daughter Charlotte shortly afterwards. Charlotte left Woods in 1915 only to return again in 1920, the reason for her absence is unclear. Frederick produced many designs for Woods, amongst them were the tube lined Elers and Trellis patterns and it was not long before the popularity of the tube lined designs persuaded Harry Wood to acquire the Crown Pottery which was adjacent to the Stanley for the production of art wares. This new venture was set up under the name of Bursley Ltd. in 1920. The Crown Pottery was well equipped being one of the first potteries in the Stoke on Trent area with a Dressier Tunnel Kiln, until then all firing at Woods had been done using Bottle Kilns. The Ellgreave and Alexandra potteries continued to use Bottle Kilns until the late 1940's. The Dressier Kiln which was approximately 75 feet in length was gas fired and only rarely cooled for maintenance work to be carried out. The racks holding the pieces to be fired were passed through the kiln on trolleys. If a trolley became jammed or derailed workers would don asbestos suits and carry out work in the cooler ends of the tunnel whilst the kiln was still being fired. In the early 1920's Woods purchased shares in the Ellgreave Pottery to such a degree that a number of the Woods family were on the board of directors. The Ellgreave Pottery was originally sited in Ellgreave Street, but moved in the early 1960's to the Wharf site. Initially the pottery was used to produce brown Lottie Rhead Ware although later it was used to produce teapots. Charlotte was a highly skilled tube-liner as well as designer, one of her tasks was to train staff and supervise the production of tube line ware as well as create new designs. Charlotte finally left Woods in 1926, but her father continued as art director until 1929. Another talent which blossomed under the care of Harry Wood was Edward Thomas Brown Radford, who was initially employed in the early 1920's as a sales representative and later as a sales manager. His designs of hand painted ware were sold through H.J. Wood and although he left Woods around 1930 and set up his own pottery making hand thrown ware, Woods continued the production of Radford's designs for many years. In 1931 Susie Cooper was looking for premises to house her fledgling company and once again Harry Wood showing his unerring eye for new talent, offered her space at the Crown Works. Wood and Sons became the main supplier of white ware for the Susie Cooper pottery, thus Harry combined the support of a new designer with good business. By 1933 the pottery had become an associate member of Wood and Sons, with Susie Cooper becoming a director and shareholder of Bursley Ltd. Throughout this period and up to 1959 when she purchased the factory from Woods, she retained full artistic control. Up until the 1930's H.J. Wood was still being run as a separate company, but when it ran into financial problems Harry Wood took over control and led the enlarged company throughout the difficult war years although by then he was in his late sixties. The earliest production of Toby jugs is uncertain but it is thought that H.J. Wood produced Toby jugs early in the 20th century, one of which was the female Toby known as Betsy. Another jug which can be dated more accurately is the Tobias Toby jug which was produced under the Bursley Ware name. The Ellgreave pottery also produced the ordinary or tubby Toby around this time (c.1925) painting the jugs in bright colours such as orange, blue and yellow, which made it necessary to use the enamel over glaze technique. The production of Toby jugs fell into decline and was not revived until the early 1950's. Although the exact origin of the Tubby Toby design is unclear the Ellgreave style jug was copied by many other potteries and was produced by the varying Woods companies in a modified form until 1995. Elizabeth Capper was a director at the Ellgreave pottery and had responsibility for the production and sale of the fancy goods. When the decision was made to transfer this production to the Alexandra pottery Elizabeth Capper moved to H.J. Wood, becoming the sales manager and a member of the board of directors. After the war Harry Wood built up the export trade again and after retiring retained a keen interest in the day to day running of the business. Harry's four sons Paul, H. Francis, Kenneth and Guy took over control of the company shortly after it went public in 1954 and formed the new Board of Directors, the eldest son Francis becoming the Chairman and Managing Director. Kenneth took on the responsibility for H.J. Wood and Paul became works manager. Just over half of the shares were owned by the family and a large proportion of the remaining shares were held by employees, so few shares were available for the general public. Also at this time the Ellgreave Pottery was fully absorbed into Wood and Sons, the name Ellgreave finally disappearing in 1978. By the early sixties Paul Woods son Tony Wood was Managing Director of Wood and Sons, a public company employing upwards of a thousand people, Tony Wood took over the role of Chairman and Managing Director in the late seventies. It was during this period that the production of Toby Jugs reached its height with many new designs being introduced. During the 1970's Woods had to fight two takeover bids from local companies, the first in 1975 by a small family company called Barrets and in 1979 by Staffordshire Pottery. The later was subsequently purchased by Colorol, only to go into receivership, although it is possible that the company still exists after a management buyout. The unfortunate effect of fighting these unsuccessful takeover bids was to weaken the company and by 1981 the companies financial position had deteriorated to such an extent that it was found impossible to continue, the bank took control of the business and by 1982 it was necessary to call in the receivers. The business was purchased by Edmund Yorke, who had been the company secretary in the old Woods company for many years, he was joined by his nephew Norman Edmund Yorke who had been the accountant at Wood and Sons. They continued the production of tableware in the Stanley Works, Newport Lane, Burslem with the name of Wood and Sons living on but no longer under the control of the Woods family until 2005 when they finally closed. In 1982 Tony Wood in partnership with Elizabeth Capper opened Tony Wood Studio 1982 Ltd for business. The pottery was sited at the Rising Hawk factory at Fenton. Production of the old Wood & Sons Toby jugs was continued but like any new company the desire to break away from the past produced a range of new jugs. By 1985 production was moved to the Capper Works, Milburn Road, Cobridge. New ground was broken with the agreement to supply Arthur Bell of Scotland Direct with a series of character jugs called the Guild of Wood Pottery Collectors, Ralph Wood Collection which were sold by mail order. For a number of years the company prospered, but within six years the receivers were called in and by 1991 the company was sold. As is the way pottery companies come and go, but with the demise of Wood and Sons, followed in relatively quick succession by Tony Wood Studio 82 Ltd, an association between the Woods family and the potteries which had spanned over two hundred years was finally closed. The new company known as Wood Potters of Burslem was owned by Scotland Direct. The company was managed by Mark Boulton who was Tony Woods godson until 1995 when it ceased trading. A number of the moulds owned by Wood Potters were sold to Price Kensington of Burslem and other local potters. Many of these moulds have been put into service with a number of Woods and Shorter pieces being made, these are produced by various potters amongst them is Cortman using the 'Old Ellgreave Pottery' and Cortman mark.